Vancouver, British Columbia--(Newsfile Corp. - February 11, 2019) - Ethos Gold Corp. (TSXV: ECC) ("Ethos" or the "Company") is pleased to announce that it has received approval for trenching and drilling of its La Purisima gold project in north-west Chihuahua State, Mexico. A field crew has been mobilized to the project and trenching work with a backhoe is commencing imminently. The Company anticipates that the trenches will be relatively shallow and that the trenching work will proceed rapidly. Drilling is planned to begin in March, 2019 shortly after the initial trench assay results are received. The exploration model for the La Purisima Mine area is for a near surface, bulk tonnage, oxide gold target. A northwest trending mineralized zone has been identified over a strike length of at least 2 km with a width of alteration and geochemically anomalous gold of approximately 600 meters. Within this footprint are two north-west striking zones that have the strongest gold anomalies, each approximately 200 meters wide (see figure below). One of these (the "Purisima Vein Zone") strikes for at least 2 km, and the other (the "Stockwork Zone") strikes for at least 1 km. Both zones appear to extend under a thin alluvial cover consisting of gravel and soil deposits. Gold and silver mineralization is contained in quartz veins and veinlets forming stockworks and sheets in both volcanic flow rocks and older discordant sedimentary rocks. La Purisima is located in an area of low relief with excellent road access and infrastructure. The concessions are located on private ranch land and a long-term annual fee based property access agreement has been signed with the land owners (see Figure 1). Commented Craig Roberts, P.Eng., President and CEO of Ethos: "We are excited to be now moving ahead at La Purisima with machine trenching followed by our maiden drill program. Historic work documented by the Mexican government reports (1994, Guzman and De La Fuente; CRM Report; "Concesion Minera de Explotacion Purisima Municipio de San Buenaventura, Chihuahua") indicates areas with multi-gram gold values localized in multiple sub-parallel epithermal veins, as well as disseminated gold mineralization around the Purisima Vein described in the historic Purisima Mine. The target area is sizeable covering at least 2 km of strike and is largely untested by modern and systematic exploration methods. Project access and infrastructure is very good allowing a modest initial budget for trenching and drilling at La Purisima of approximately $US 350,000. We will report initial trench results as soon as results are received and analyzed and provide an update on the planned drilling at that time." Trenching samples will be shipped to the ALS-Chemex sample preparation facility located in Hermosillo, Sonora Mexico. ALS-Chemex Hermosillo preparation labwork will consist of splitting and grinding to fine pulp culminates followed by shipment of 150 grams to the ALS-Chemex Vancouver, B.C. analytical laboratory where gold analysis by 30 gram fire assay with AA finish of dissolved final metal mixture will be completed. In addition a second small sample fraction will be dissolved in 4-acid mixture and processed for ICP determination of a standard 35-element package. Mel Herdrick, a director of and consultant to the Company, is a Qualified Person as defined under National Instrument 43-101, is supervising the La Purisima trenching and drilling program and has read, reviewed, and approved this release. Jo Price, M.Sc., MBA, P.Geo, VP Exploration of the Company has also reviewed and approved this release. Ethos Gold is exploring the Pine Pass vanadium project located on Highway 97 in northern, British Columbia as well as the La Purisima gold project in northwest Chihuahua State, Mexico. 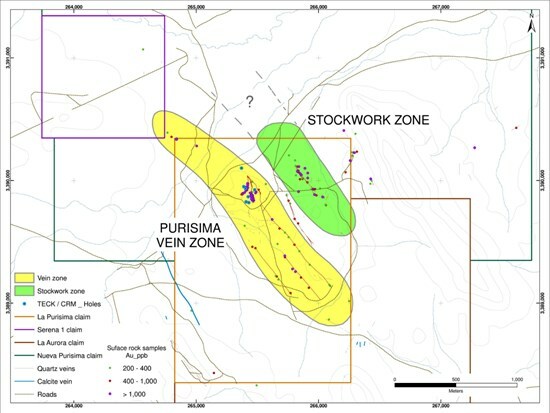 Initial trenching and other exploration work at Pine Pass indicates the potential for a black shale hosted zone of vanadium mineralization in the range of 100 meters in thickness and with multiple kilometers of prospective strike length. A maiden drill program at Pine Pass is planned for the summer of 2019. At La Purisima the exploration model is for a near surface, bulk tonnage oxide gold target. A trenching program is now commencing with a maiden drill campaign planned to commence in March, 2019. Ethos is well funded for the planned exploration programs with a current net cash balance of approximately $Cdn 7.1 million. This press release contains certain "forward-looking statements" within the meaning of Canadian securities legislation, including statements regarding the development and execution of a contemplated La Purisima trenching and drilling program, and a planned summer 2019 drill program on the Company's Pine Pass project. Although the Company believes that such statements are reasonable, it can give no assurance that such expectations will prove to be correct. Forward-looking statements are statements that are not historical facts; they are generally, but not always, identified by the words "expects," "plans," "anticipates," "believes," "intends," "estimates," "projects," "aims," "potential," "goal," "objective," "prospective," and similar expressions, or that events or conditions "will," "would," "may," "can," "could" or "should" occur, or are those statements, which, by their nature, refer to future events. The Company cautions that Forward-looking statements are based on the beliefs, estimates and opinions of the Company's management on the date the statements are made and they involve a number of risks and uncertainties. Consequently, there can be no assurances that such statements will prove to be accurate and actual results and future events could differ materially from those anticipated in such statements. Except to the extent required by applicable securities laws and the policies of the TSX Venture Exchange, the Company undertakes no obligation to update these forward-looking statements if management's beliefs, estimates or opinions, or other factors, should change. Factors that could cause future results to differ materially from those anticipated in these forward-looking statements include the risk of accidents and other risks associated with mineral exploration operations, the risk that the Company will encounter unanticipated geological factors, or the possibility that the Company may not be able to secure permitting and other governmental clearances, necessary to carry out the Company's exploration plans, and the risk of political uncertainties and regulatory or legal changes in the jurisdictions where the Company carries on its business that might interfere with the Company's business and prospects. The reader is urged to refer to the Company's reports, publicly available through the Canadian Securities Administrators' System for Electronic Document Analysis and Retrieval (SEDAR) at www.sedar.com for a more complete discussion of such risk factors and their potential effects.